Big drops of red raspberries drip off into my hand. I pick. I eat. I pick some more. Very few make it all the way indoors. Why did I wait so long in my gardening life to plant raspberry briars? Oh, right. Because they are briars, suckering up all over the place. Encroaching on the vegetable garden path. Making their way out toward The Shrubbery. 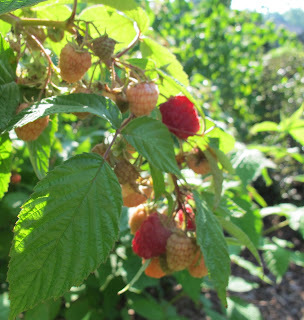 But all is forgiven when I stand there, precariously making my way between the raspberries and nearby roses to pick and eat those big drops of red raspberries. They do look good. What kind do you have planted? Red raspberries are so delicious. I have a patch which I treasure, but I have just resolved to remove my black raspberry row. They are not only much wilder and thornier than the reds, I simply cannot keep them irrigated in this drier world. I love raspberries and so does my young granddaughter. She likes to put them on her fingers, and then eat them! Lol! Luscious red raspberries. One of the most perfect fruits of summer. I inherited some bushes and loved them, but mine stopped producing berries a couple years ago. I keep meaning to replant. I shall have to research what varieties will thrive in zone 5 . Wonderful to grow your own fruit so that you can snack and pick at the same time! Mm, raspberries. Yum. I learned to tend raspberry bushes from my dad. Now I have a row along our side fence. The kids check it at least 3 times per day to see if there are any more ready. I think fresh sun-warmed berries make up for large amounts of weeds to pull.